It’s also worth mentioning the practical difference between having your own light therapy device at home vs going to a clinic every time. First of all the cost is a lot cheaper staying at home. Clinics are notorious for charging a fortune which makes little sense when buying your own premium high powered device costs about the same as only 2 or 3 clinic sessions. Clinics are also only open at normal business hours in general – the same hours most people are themselves working. Emma: For localised benefits to the skin, how do you recommend red light to be used (how close to the face for example, for how long, and any other tips). Joe: For using a red light device on the face, I recommend using one at 0 – 30 cm from the face for 2 – 20 minutes, depending on distance. This can be done every day, even several times a day for general use. It’s especially helpful to use the light as soon as possible after things like excess sun exposure, shaving, showering, cuts/bruises, city pollution exposure and even irritating makeup use. As the red light is intensely bright, you can use red light blocking glasses to shield the eyes if you want to. Infrared light also works well for using on the face, since it doesn’t stimulate the eyes. Emma: And for more general systemic benefits? Longer exposure – applying the light for a much longer period of time. This ensures that enough light energy penetrates deeply into the body. Specific exposure – Targeting key areas of the body with light enables systemic effects. The thyroid gland in the neck (pictured below) or testes in men are two examples. 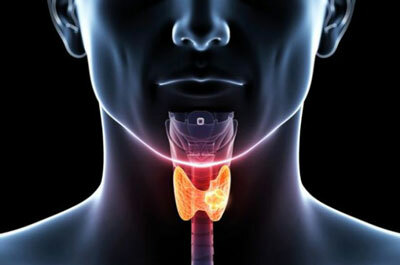 (Study link here regarding benefits to the Thyroid). Stronger light – using high powered devices such as our red or infrared light device can project a good strength of light over a wide surface area of the body. There are several potential mechanisms for systemic anti-stress effects. Using on specific glands of the body improves hormone production in those glands, which are passed to the rest of the body via the blood. The blood itself is also a vehicle for the benefits. Red blood cells themselves actually don’t have mitochondria, but platelets, white blood cells are other components do. Some studies have been done where the light is applied to a vein on the side of the neck or other area, resulting in positive outcomes elsewhere in the body such as improved female fertility (study link here). Even bone marrow is a proven carrier of benefits, as studies show applying light to bones in the feet and legs can improve heart health and speed up healing in other areas. Infrared light is perhaps better than visible red if you are looking for general systemic benefits as the penetration rate through tissue is greater than red. Emma: For someone with no major health concern, how can light therapy be of benefit to them? Even for people without a specific ailment, red/infrared light therapy will improve quality of life and wellbeing, in addition to first aid uses. It’s fairly similar to if you improve the quality of your diet, make an effort to get more sleep, or reduce work-related stress – you can expect to simply feel better and be happier in general. This can have an effect on those around you and ultimately leads to a better life. Improving energy production and reducing stress with light therapy, much like other positive lifestyle choices, enables your body to function optimally, leading to better; mental function, sexual function, exercise performance, strength, endurance, digestion, longevity, sleep and several other daily life type things. Using a red/infrared light first thing in the morning and before bed is a good protocol for general anti-stress effects. Using after any sort of injury or just randomly throughout the day is good too. In addition to the anti-stress effects, I also consider red light as an essential first aid device too. Any time you get a cut, sunburn, skin irritation (from any source, i.e shaving, body hair removal, harsh chemicals, etc.) and any sort of minor/serious injury, it’s great to have a red light handy. It cuts the pain and inflammation down, kick starts the healing response, and ensures speedy healing without scar tissue. 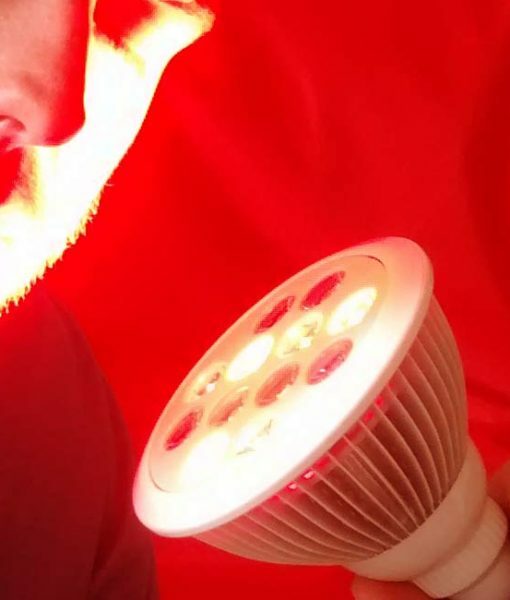 I have no doubt that sources of red/infrared light will be built into our houses in future, to give passive exposure in places like showers, beds, even in our cars. Emma: Nutritionally, you advocate the kind of way of eating that I also recommend. In terms of general skin benefits (regulating collagen production, increasing/preserving elastin, promoting cell turn over, etc.) what do you see to be some of the most important dietary factors? Joe: Like you, I try to base my diet on the same principles as what I aim to gain from light therapy – that is to reduce stress and improve energy production in the body. Having said that though, the field of nutrition and diet is one of the most complicated and least understood areas of modern science. I fully expect to reassess my opinion on certain foods in the future. As a society we probably know more about quantum physics than we do about diet. It doesn’t help that people are very emotionally attached to their diets, with certain foods being very polarising. Sugar, salt, saturated fat, cholesterol and such are all examples of what I mean. There’s a strong bias in society towards the status quo of conventional nutrition wisdom, which unfortunately seems driven by marketing and is very slow to change. Governments, big business, doctors and educational establishments all reinforce the bad advice (and sometimes good advice) in a very authoritarian way, without empowering an individual to self-educate. I’m talking whole grains, ‘cholesterol-lowering’ margarines, low-salt or low-fat foods, no-added-sugar foods and so on. If I was to recommend specific dietary factors, it would be to consume foods containing enough glucose (fruit, sucrose) and protein (dairy, fish, etc) and avoid foods containing liquid oils. I think an even split between carbs/protein/fat is desirable for the average person, with a lowering of fat if you have a good metabolism and want to lose weight. For supplements I subscribe to the same philosophy of improving energy/metabolism, and find niacinamide, vitamin k, and others to be useful. Though I don’t use any supplements with great regularity, besides red and infrared light.